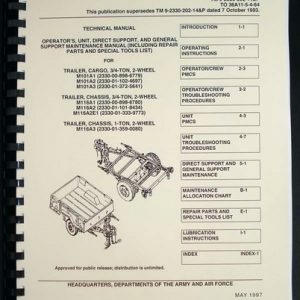 For sale is reprint of ARMY manual TM 9-2330-313-14&P for 1-1/2-ton 2-wheel cargo trailer M103A1, M103A3, M105A1 M105A2 M105A2C, M107A1, M107A2, M107M2C, M448. Manual is dated October 1990. Manual is over 400 pages long, 1″ thick and 2.5 Lbs in weight. 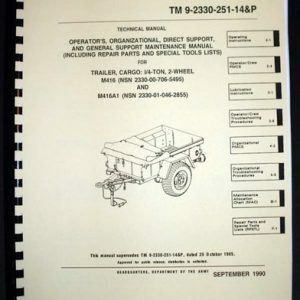 Manual includes Operating instructions, Lubrication, Troubleshooting. 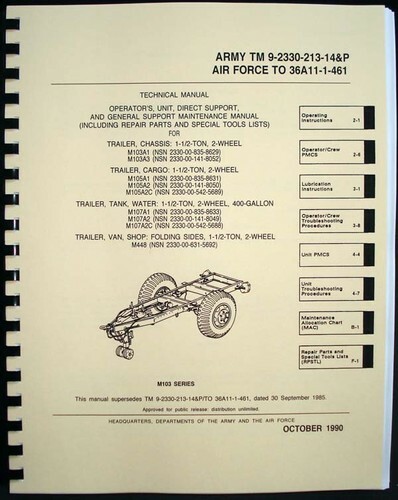 Biggest part of the manual is parts breakdown for every assembly of the trailer. Every part is illustrated and detailed. Replacement procedures, Maintenance and part lists are included. A lot of these trailers are available on surplus market. 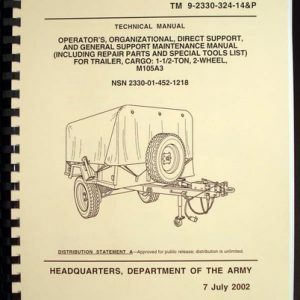 This is a real PAPER Manual, not a PDF on home burned CD-ROM. Manual will be shipped Media Mail.